Storage can be stylish! 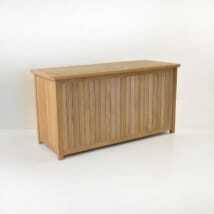 Introducing our beautiful range of Blanket Boxes from Teak Warehouse. The Blanket Boxes we have on offer give you the option of storing cushions, blankets and outdoor accessories easily while providing a simple, stylish trunk to feature in your space. We know that you want quality, so we have made these trunks out of A Grade Teak. Teak is the most durable, hard wearing wood for outdoor use. The proof is in the purchase! Full of natural rubber and oil, this A Grade wood is strong, elegant and long lasting. Our Blanket Boxes feature elegant panels of A Grade Teak, fitted with air vents and are sealed with rubber to reduce the danger of exposure to water, so be assured you are getting the best quality design, all in a charming treasure chest! These gorgeous high quality Blanket Boxes are best kept under a sheltered area for maximum protection of your cushions, blankets and swimming accessories. Our trunks can double up as a coffee table when you’re not using the items inside! The perfect rectangular size, the Small Teak Trunk will store small cushions, toys and serving items, while you enjoy platters of h’or d’oerves and a lovely glass of something special! We sell Blanket Boxes for indoors as well as out! Keep in your entrance way as a charming place to store winter boots and parkas! 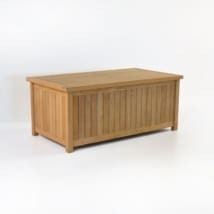 Teak Blanket Boxes are just some of the many exciting additions to outdoor furniture from Teak Warehouse. We carry an extraordinary range of patio, garden, and balcony furniture, and all at wholesale prices. Call us today to discuss the best options for your outdoor living area.